Many pet owners wonder what to feed a dog with diarrhea. It's a common condition in canines that has many causes. Understanding the different types of diarrhea dogs can encounter will help you decide how to best help your four-legged family member. It's no laughing matter when a dog has runny poo. In some cases, the upset stomach has a simple explanation, such as 'garbage gut' where the dog eats something he shouldn't. Other times the picture is more complicated because diarrhea in dogs is often a symptom rather than a diagnosis. Pet parents should discuss with their veterinarian whether their dog has acute or chronic diarrhea in order to find the best diet. Acute diarrhea comes on suddenly and has been present for less than one week. As a generalization, acute diarrhea is often the result of garbage gut, a sudden change of diet, or picking up a bacterial, viral, or parasitic infection. Diet plays a key part in successful treatment. Feed the wrong food and you prolong the upset. For acute diarrhea where the dog is otherwise well, you need to rest his digestive system. By withholding food for 24 hours it allows the gut to repair and recover. Whether to feed a dog during this time is controversial, but the more widely accepted opinion is that food only stimulates the gut to contract and extends the time a dog with diarrhea is ill. Always ensure plenty of fresh, clean drinking water is available. The dog will need to drink plenty to replace fluid lost in diarrhea. If he isn't drinking, then dehydration is a risk, so seek vet advice whether he should be seen. After 24 hours reintroduce a bland diet (rather than his regular diet) to the dog. The rule of thumb for DIY dog food is to offer bland, white or low-fat meats, along with easy to digest carbohydrate such as boiled potatoes, pasta, or rice. Avoid flavoring with milk, butter, cream, or oil, as even in healthy dogs these can trigger diarrhea in some cases. 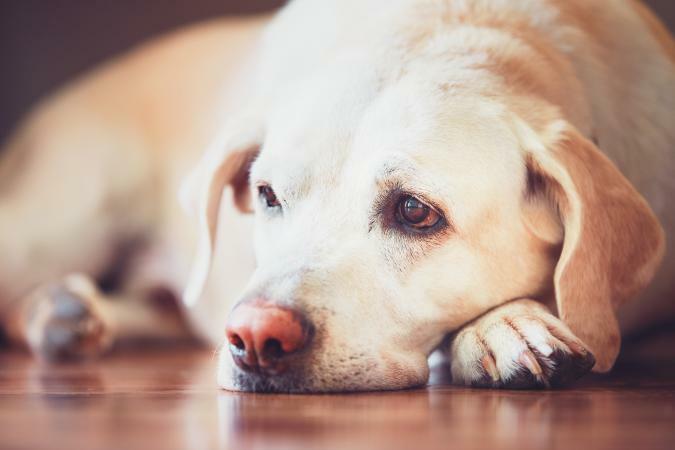 Some dog owners will feed dogs with diarrhea eggs, particularly scrambled eggs, which should be avoided as sometimes they can exacerbate the problem. Another common ingredient used for dogs with diarrhea is rice water. Dog owners might think canned pumpkin is a strange item to feed their dogs, but it's actually an excellent source of fiber. By adding fiber to the diet, it causes a dog's stool to absorb more water and decreases the intestines' PH level. Fiber also can aid in the growth of "good" bacteria that helps the execratory system to function properly. The fiber in canned pumpkin can also help minimize the growth of "bad" bacteria that leads to sick intestines and diarrhea. A common bland diet for dogs is a mixture of 75% cooked white rice to 25% protein. The protein can be boiled chicken breast, turkey breast or ground beef as long as it's drained of all fat. Another common diet recommended by Dr. Karen Becker involves making a mixture of 50% cooked ground turkey and 50% canned pumpkin. You can also substitute fresh cooked pumpkin, cooked sweet potato or instant mashed potatoes. Feed typically one-quarter of his usual serving broken up through several feedings throughout the day. Feed one to four tablespoons of canned pumpkin, starting out with one tablespoon and gradually adding more to his meals. If diarrhea does not reoccur and once the dog's poop is starting to form, you can slowly increase the amount you feed at a single sitting and then gradually switch your dog back to his regular diet. Monitor your dog for any recurrence of diarrhea and avoid giving your dog treats or chews during this time. Table scraps are never a good idea and are particularly bad for a dog with an upset intestinal tract. Your veterinarian may recommend that you give your dog OTC medications for stomach distress such as Kaopectate or Pepto Bismol. Imodium may also be suggested although it can cause problems with some breeds like Collies and can only be given for a short time. Never give your dog any medications without speaking to your veterinarian first and follow his or her dosing instructions carefully. Chronic diarrhea has either persisted for more than seven days or waxes and wanes (the symptoms come and go) for a period of weeks or months. Chronic diarrhea most commonly arises when the upset stomach is a symptom that the dog has an internal problem such as liver or kidney disease, dietary allergies, or problems with the bowel wall. For cases of chronic diarrhea, the picture is a little more complicated. 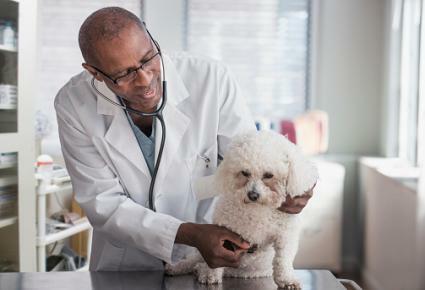 It's important to take your dog to the vet to investigate the underlying cause of diarrhea in case it's due to a serious medical condition. Hill's Prescription Diet i/d Canine Stress Rice, Vegetable & Chicken Stew - A dog with chronic diarrhea may be experiencing undue stress leading to an unhealthy gastrointestinal tract. This diet contains microflora to help restore the intestine's bacterial balance, as well as high fiber and low fat. This food requires a veterinary prescription. Hill's Science Diet Adult Sensitive Stomach and Skin Salmon & Vegetable Entrée Dog Food - Available in a canned formula, your veterinarian may recommend this food if your dog's chronic diarrhea is due to reactions to certain food ingredients. Hill's also sells a dry version, d/d Canine Potato & Duck Formula. ProPlan EN Gastroenteric Fiber Canine Formula has a higher fiber content and a prebiotic fiber that helps to support your dog's intestinal tract. It comes in a dry and canned version and you must have a veterinary prescription to purchase. Royal Canin Large Digestive Care Dog Food is made specifically for large dogs with digestive problems. The food has high-quality protein, microflora and digestible fiber. A prescription is not required although you should discuss choosing this diet with your veterinarian before using it. Don't allow your pet to eat bones, sticks or rocks. Exercise your dog regularly and keep him at a healthy weight. In the first instance, for the dog that is otherwise well, rest his digestive system for 24 hours. Then reintroduce bland food such as boiled potatoes, feeding little and often. If the dog takes a turn for the worse, such as vomiting, going off food, or producing blood then take the dog to the vet. Since diarrhea can be a natural elimination response in canines, it is not usually necessary to take the dog to the vet at the first sign of runny stools. This is especially true if the dog is showing no other concerning symptoms. If diarrhea lasts for more than a day or two, a call to the vet is a good idea. There are also certain situations that warrant contacting the vet. The dog might have eaten something poisonous. The dog isn't fully vaccinated. The dog is a puppy. When your dog has diarrhea, it can be a worry. However, many times when he is otherwise well, caring for the dog at home by feeding a bland diet of boiled potatoes or similar foods, is sufficient. Keep monitoring the dog's stools and if he gives cause for concern, then see the vet immediately.